Northwestern accepted 8.9 percent of its applicants for the class of 2023, Christopher Watson, the dean of undergraduate enrollment, told The Daily in an email. Having risen from last year’s record low of 8.4 percent, this year marks the first time in a decade that Northwestern’s acceptance rate has risen. The acceptance rate rose in 2009 to 27.1 percent from 2008’s 26.2 percent, but had fallen every successive year until 2019. In 2017, the acceptance rate fell below 10 percent for the first time, where it has remained ever since. 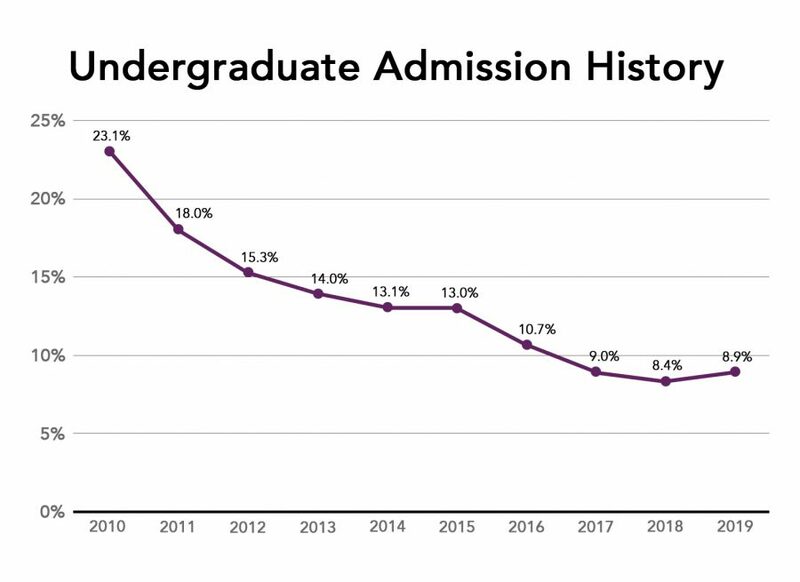 Northwestern’s acceptance rate over the years. 2019 marked the first year in a decade in which the acceptance rate rose. At a time when declining single-digit admissions rates have come to signal prestige for elite universities, the news is a notable shift for Northwestern. Schools like Harvard and Yale posted a drop in rates, underscoring just how cutthroat admissions have become. But other schools like Princeton and Cornell also saw a rise in rates, though Princeton’s rate is closer to 6 percent, while Cornell’s is closer to 10. Watson predicted Northwestern’s rate would remain about the same when the University announced the number of applications this year flattened. President Morton Schapiro said he had expected applications to stabilize. NU received 40,579 total applications this year, setting a new record after last year’s high of 40,425. Of those 40,579 applications, 4,399 were submitted in December through the Early Decision process. The acceptance rate was about 25 percent for Early Decision applicants, who are expected to make up 53 to 54 percent of the class of 2023, Watson told The Daily in a December email. After considering Early Decision numbers, the Regular Decision acceptance rate becomes about 6.9 percent. For the class of 2022, the Regular Decision acceptance rate was about 6.4 percent. While the acceptance rate rose from 2018, the 8.9 percent rate is still slightly lower than 2017’s 9 percent acceptance rate. Students accepted in the Regular Decision pool have until May 1 to make a decision regarding their enrollment at NU.